Asking for an extension to file your return is probably one of the easiest tax chores you can face. That said, why would you want to? Because it gives you a little breathing room. Maybe you've been busy and you forgot about the deadline looming, or maybe you're still tracking down documents you need to prepare your return. You know you might not have them by April 15—or at least you don't want to risk not having them at crunch time. What Is an Extension and What Does It Do? 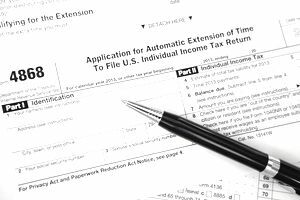 You're asking the Internal Revenue Service to give you six more months to submit your tax return when you file for an extension. The deadline for your 2018 personal return is April 15, 2019 unless you live in Maine or Massachusetts, where April 15 is observed as Patriot's Day. The next day—April 16—is Emancipation Day in the District of Columbia, so this gives folks in Maine and Massachusetts two extra days to file their return. They have until April 17. An extension gives you until Oct. 15 to file your return, no questions asked. Just file IRS Form 4868 instead of your tax return on or before the April deadline. The extension is automatic—you don't have to chew your nails waiting for a nod of approval from the IRS. When it receives your request form, that's the end of it...or at least it's the end of the extension process. You still have to file your tax return, but you now have six more months to do it. Unfortunately, your payment is still due by the April 15 deadline if you owe taxes. Filing an extension doesn't give you additional time to address any taxes that are owed, and the IRS charges interest and sometimes even penalties on tax payments made after the April deadline. If it turns out that you do owe the IRS money, or if you even think you might, it's best to send payment for the amount you've estimated when you submit your extension. It's usually a good idea to go ahead and prepare your tax return in April even if you don't file it yet for this reason. It will at least give you a rough idea of what you owe—if you owe. Don't worry if your estimate is wrong and it turns out that you don't owe that much after all. The IRS will send you a refund, and it's better to be safe than penalized and sorry. And if you end up owing more than what you estimated, you'll at least have cut your penalties and interest to just the portion of the tax debt that you were short. Download Form 4868, the Application for Automatic Extension of Time to File U.S. Individual Income Tax Return, from the IRS website. If you've calculated that you probably owe tax, write a check for that amount and mail the extension form with your check. The form comes with a list of addresses telling you where to send the form and your payment, depending on the state in which you live. Send the extension form by certified mail with return receipt requested so you have proof of the date you mailed it and when the IRS received it. It must be postmarked on or before April 15. You can also file an extension online with the IRS, and there's no need to also mail in a paper Form 4868 if you use IRS Direct Pay to make your payment and you mark it as an extension payment. The IRS will accept this as notice that you want an extension. It's that easy. If you can't afford to pay your taxes in full in April or even by the October deadline, you can usually set up an installment agreement with the IRS to pay the debt off incrementally over time. It's possible to file an extension and pay federal taxes using a credit or debit card. Several IRS-approved credit and debit card services can be found on the IRS website: Paying Taxes by Credit or Debit Card. This comes with a word of warning, however. These are third-party services and they charge fees for the courtesy of processing tax payments. But if you pay at least $1 of the tax you think you owe using a debit or credit card, you won't have to file the extension form in this case, either. Your payment acts as an automatic extension just as if you had made the payment through IRS Direct Pay. Most tax preparation software programs will also file an extension for you—another good reason not to start sharpening your pencils and hunt for your calculator to prepare your tax return on your own. Most programs do this for free, so go to TurboTax or another tax preparation website, tell it that you want to file an extension, then do your taxes with easy prompts when the time comes.